Billericay Town maintained their improved League form under Harry Wheeler with a hard-fought 3-2 home win over Truro City. After racing into a two goal lead within the first half hour courtesy of a double strike from Moses Emmanuel, the plucky Cornishman struck back through a Nick Grimes brace to level early in the second period. 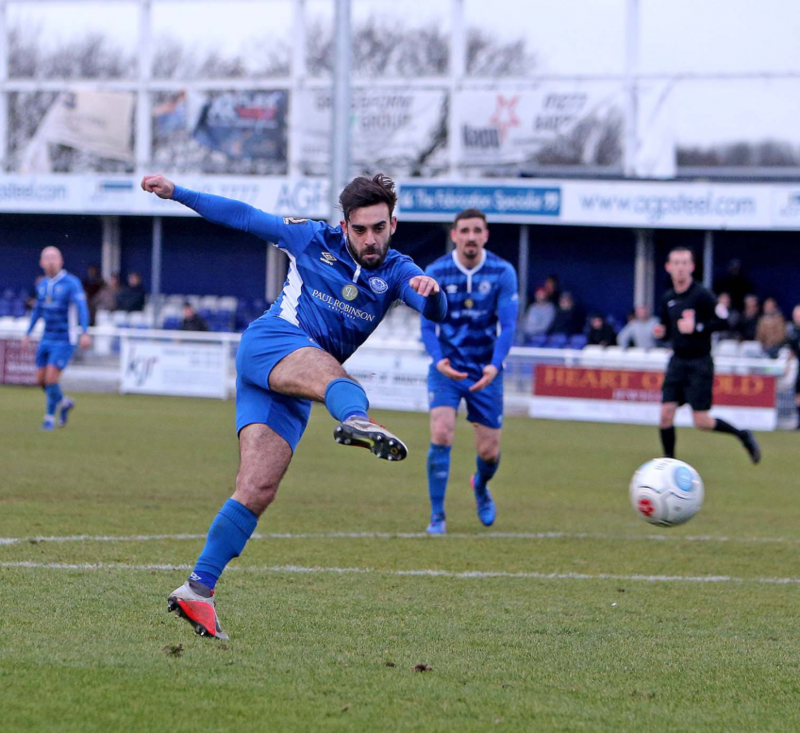 The Blues would not be denied maximum points from their three matches under Wheeler, securing victory with a well-directed Sam Deering half volley. The “Billericay Band” back together pre-match. With the onslaught of Storm Erik unable to defeat the improved drainage system at the AGP Arena, the match went ahead despite a number of weather related postponements on the day. A playing surface in very good condition, despite showers during the week, provided the setting for an exciting match. Blustery conditions peaked just before kick-off but eased off as the game progressed. 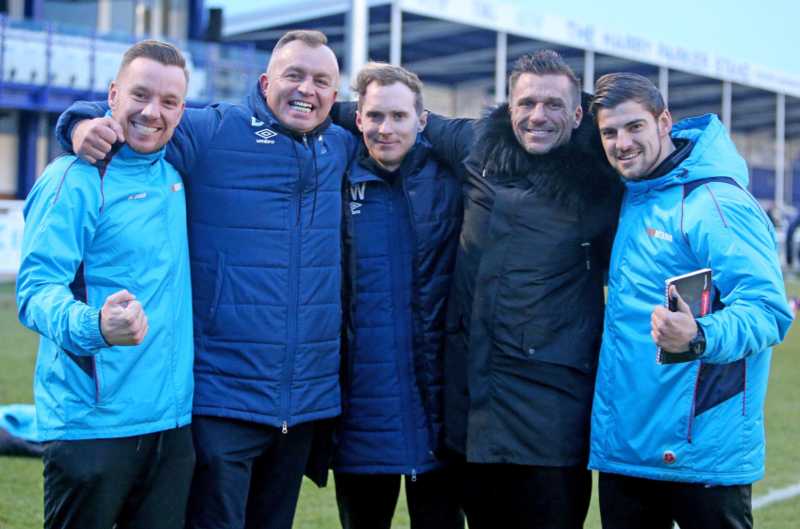 The match marked the return of the final “band member”, owner Glenn Tamplin. Back from sunnier climes after an absence dating back to late October, he watched from the bench for just over an hour. Under the direction of his recently installed management team, he would witness a spirited and committed home performance. Billericay fielded their preferred 4-2-3-1 formation making two changes from the previous League fixture versus Welling United. In came left winger, Jamar Loza, and creative midfielder, Deering at the expense of Kieron Cadogan and Ross Lafayette. With Loza and Emmanuel placed high on the flanks, Truro’s wing-backs were forced back and were less effective in offensive areas than usual during the game. Adam Coombes continued as the lone frontman but was well supported from other attacking positions. Truro also made two amendments to their starting X1 from those that took the field last Tuesday night at Treyew Road versus Wealdstone. With influential midfielder, Riven Allen, only fit enough for the bench, in came Ben Harding who facilitated a switch in line-up to 3-5-2 by dropping into the back-line. Plymouth loanee, Alex Battle, came into midfield in place of Nick Hurst who has moved on to pursue a career opportunity in Dubai. During the game, White Tigers manager Leigh Robinson, was prepared to be tactically flexible changing to a back four and pushing Harding forward, which helped to establish a stronger foot-hold in midfield in the second half. Moses Emmanuel opens the scoring. Expectations of a high scoring game fuelled by both sides proficiency in front of goal, combined with weaknesses at the back, looked prescient. Perhaps taking advantage of the travelling sides four and a half hour coach journey that morning, the hosts raced into an early lead on 3 minutes through Emmanuel. Returning to the team, after missing the Essex Senior Cup Semi-final on Tuesday night due to illness, he drove home from 10 yards. Freed by an exquisite ball across from Coombes, which bypassed three Truro defenders, the speedy frontman finished past the fluorescent pink clad figure of Truro goalkeeper, Harvey Rivers. The Cornishmen soon hit responded with left wing-back, Connor Riley-Lowe, at the centre of a number of attacking moves in the first half. Eager to scamper forward, and blessed with fine delivery, he advanced unchecked on the left flank in the sixth minute and sent a superb cross onto the head of 17 goal marksman, Tyler Harvey. Rising in the centre of the penalty area, Harvey cleverly angled his header wide of Blues goalkeeper, Alan Julian, only to unluckily see the ball crash off the far upright. With Truro adopting a targeting of the physical presence of White Tiger striker, Jared Lewington, Billericay defenders were continually tested in the air. The match offered a good opportunity for Billericay supporters to have another look at recent signing, Loza, after a period out with injury. Still clearly easing his way back, the Jamaican winger did not disappoint during the time he was on the field. Showing good ball carrying abilities, and able to beat his man despite not yet operating at full pace, his run to the by-line in the 19th minute almost brought a second goal. Finding Jake Howells in space, the ball was moved on to Deering who shot just wide of the far post on the edge of the penalty area. Moses Emmanuel celebrates his goal with Sam Deering. The Blues, exerting control of the game at this stage, would not be denied a further goal. On 23 minutes, left wing-back, Michee Efete burst forward into the final third of the pitch and squared a ball to Coombes, ideally placed on the left side of the six yard box. A mis-kick turned into an excellent pass sideways and the final result was another goal for Emmanuel who nipped in front of Riley-Lowe to smash home from close range and record his ninth league goal of the season. In all competitions, Emmanuel’s tally rises to 17 this season, which draws him level this season with Billericay legend, Jake Robinson. 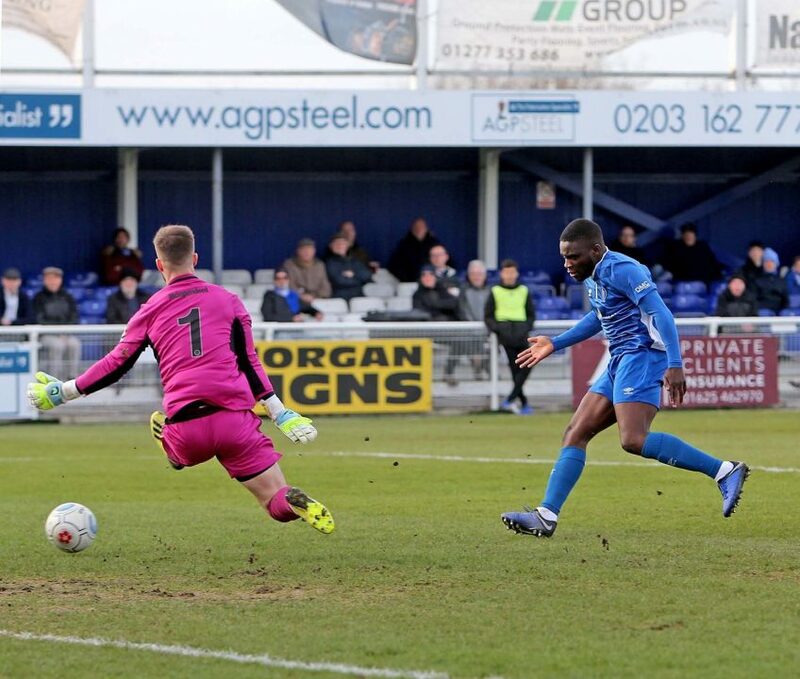 With Coombes on 12 League strikes to date in 2018/19, and turning provider today with three assists, Billericay boast a potent front-line despite the departure of Robinson to Maidstone United. Truro hadn’t made the long trip to Essex to make up the numbers and the White Tigers soon roared back into the game in the 34th minute. Predictably, the left boot of Riley-Lowe would play an important role. Lining up a free kick from around 30 yards on the right flank, his pinpoint cross travelled through a crowd of players and hit the chest of Julian in the Billericay goal. Rebounding out into play, centre-back Grimes displayed admirable goal-poacher technique to smash home from close range. The remainder of the first half saw the two teams exchange chances with Deering fizzing a shot past the upright from just outside the penalty area immediately after the Truro strike. On 40 minutes, Lewington profited from a Riley-Lowe through ball to find himself in a good position on the left. As Julian advanced, the Cornish striker elected to chip the ball over him and, for a moment, the crowd held its breath as the ball looked destined for the far corner only to fall just wide of the post. The last action of note saw Truro midfielder, Michael Herve hurriedly drive a volley over the bar from just outside the penalty area. If Billericay started the game at a faster tempo than the opposition, the favour was returned in the second half as the visitors took the initiative. The equaliser in the 50th minute had a somewhat familiar look for Blues fans as it came direct from a Riley-Lowe corner kick. Skipper Richards shook off the challenge from Rooney to send a booming header from the penalty spot towards the top corner. Grimes once again made an appearance in the six yard box and, ghosting beyond Kizzi and Howells at the far post, sneaked in to head the flying ball into the back of the net. After appearing comfortable, Billericay had now been pegged back by a determined Truro side. With both managers tweaking their formations as the game progressed, it was to be Truro that started to exercise a period of control early in the second period. A number of misplaced passes started to feature for the Blues and the fluency of the first period dissipated temporarily. Buoyed by the comeback to parity, and with Harding pushed forward into midfield increasingly influential, the next few chances fell the visitors way. On 52 minutes, Harding, who had been caretaker manager at Truro for a short spell earlier in the season, hit a thunderous shot just over the bar. Battle was next to take a shot at goal for Truro but did not threaten with an effort dragged wide. In response, Wheeler brought Lafayette on for the tiring Loza on 55 minutes and pushed defensive midfielders, Howells and Waldren, slightly deeper to reassert influence in central areas. With Efete outstanding at left back getting forward with increasing frequency, the Blues came back into the game and the ever-willing Coombes troubled the Truro back-line with his pace and movement. On 64 minutes, Lafayette latched onto a Waldren through ball but shot disappointingly wide when well-placed. Billericay continued to push and started to re-exert the authority that they had enjoyed so abundantly in the first half. On 70 minutes, the home side took the lead through the talismanic Deering. The move began deep in the Billericay half as Efete executed a nifty drag-back to beat his man and release Coombes. Departing on yet another of his forward runs, the striker exchanged passes with Waldren and hit a deep cross into the Truro penalty area. The centre bounced but was expertly dispatched on the rise by Deering. Cleverly finding space behind Harding, the midfielder, did not hit the ball as cleanly as he would like. Nonetheless, the direction of his half-volley was impeccable as the ball hurtled into the far corner beyond the despairing dive of the goalkeeper. 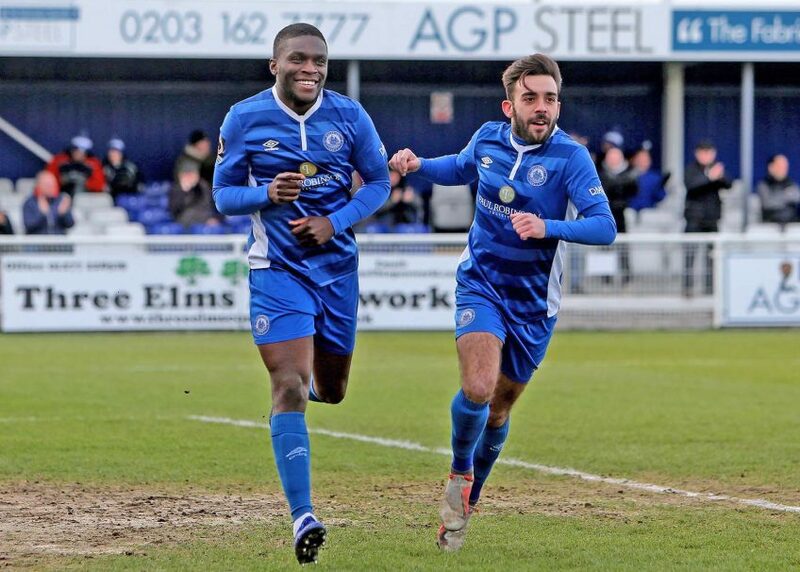 After a period out of the team through injury, Deering could not help but show his delight with a full knee-slide in front of the Billericay fans to commemorate his telling contribution. Sam Deering scores the winning goal. With Truro in need of a goal, River Allen entered play to add attacking impetus to midfield and the Cornish side pushed up aggressively to try and salvage a point. In response, Alfie Potter came on for the Blues in place of Emmanuel and almost profited from another fine Coombes incursion on the left hand side. On 81 minutes, Potter shot wide from 25 yards after Coombes had taken advantage of increased space on the left side to run half the length of the pitch to provide the assist. Lafayette would also get an opportunity in the closing minutes but combined good approach play, taking the ball well to work space and evade Grimes, with a poor finish. There would be one last chance for Truro in the closing seconds as Tyler Harvey shot on the turn from close range. With the ball blocked by the Billericay defence for a corner that came to nothing, the home side held on for a narrow win. With rivals, Bath City and Welling United both suffering defeats, the Blues now move level on points with the former but remain well placed in 5th position. Truro sit safe in 18th and have retained their seven point cushion due to East Thurrock’s defeat at Woking. 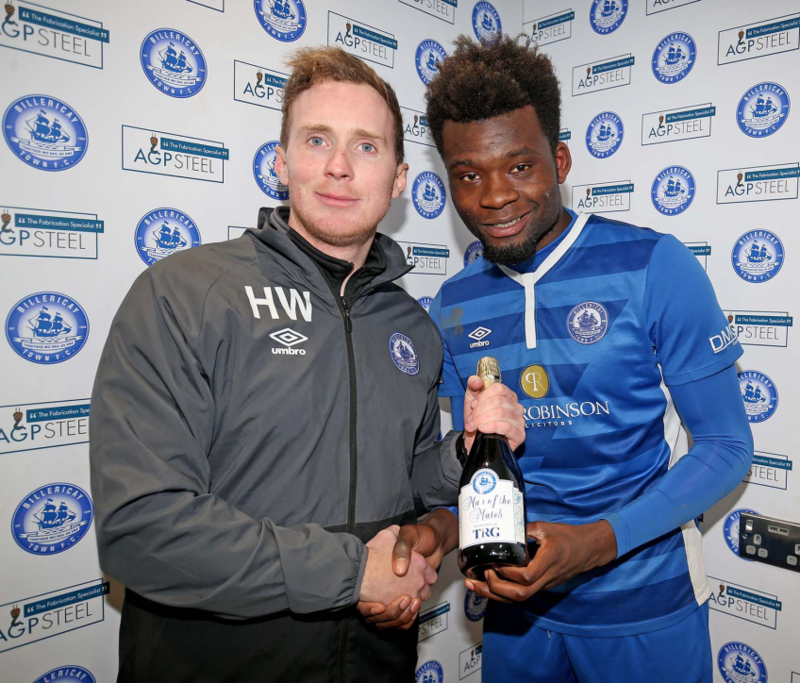 Michee Efete receives Man of the Match Champagne from Harry Wheeler. Wheeler retains his perfect League record and will be pleased with the team’s performance, which showed good work-rate and character. There are positive signs that his philosophy has been swiftly adopted and is bearing fruit in terms of results. There remain defensive concerns due to the amount of goals that are being conceded that he will wish to address over time. However, with the attack fully firing, Billericay look well placed to win exciting, high-scoring games for now. A place in the play-off’s for the Blues remains firmly on the agenda. Connor Riley-Lowe – Impressed with his advances down the left hand side and excellent delivery. Provided the cross for Harvey to hit the post and the set pieces that lead to both Truro goals. Regularly got forward and was a threat, especially in the first half. Composed in defence and manned his flank well. Goals: ’34 and ’50 Grimes.